Once an Equipment is in play, you can pay to attach it to a creature you control or to move it from one of your creatures to another. Creatures are permanents that can attack and block. You can play creatures only during your main phases when the stack is empty. 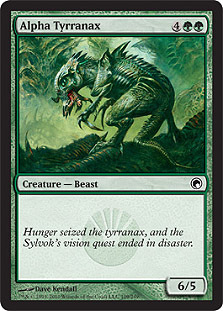 Creature cards have numbers in a box in their lower right corners. The number to the left of the slash is the creature's power. That's how much damage the creature deals in combat. The number to the right of the slash is the creature's toughness. That's how much damage it takes to destroy the creature. A creature can't attack, and you can't play any of its abilities that have (You can still use it to block-if it's untapped-and play its other abilities). Artifact creatures can attack and block just like other creatures. 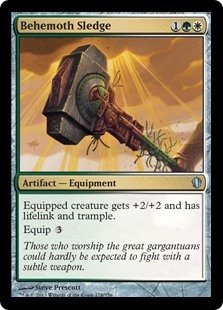 An artifact creature can be affected by anything that affects artifacts and anything that affects creatures. 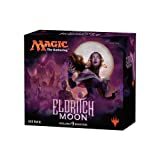 Enchantments are permanents that represent magical resources. You can play enchantments only during your main phases when the stack is empty. Most enchantments sit in play by themselves, just like artifacts and creatures. 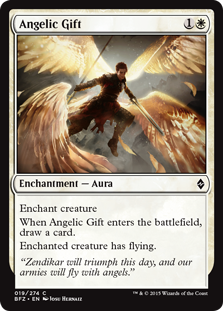 But Aura enchantments (with the type line "Enchantment - Aura") are different. They can be in play only if they're attached to other permanents. When you play an Aura, it targets the thing that will be enchanted. That means you'll have to decide what the Aura will be attached to as you play it. The Aura will say in its text box what it can be attached to ("enchant creature", enchant land", etc).. If a permanent with an Aura attached to it leaves play, the Aura is put into its owner's graveyard. It doesn't just float around with nothing to enchant. 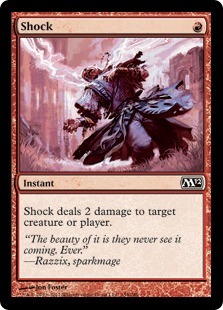 Instants are spells that you can play any time you have priority, even during your opponent's turn or in response to another spell. (You'll learn about priority later). Instant spells don't stay in play. They go to their owners' graveyards after they resolve. Lands are different from other cards because they never count as spells. 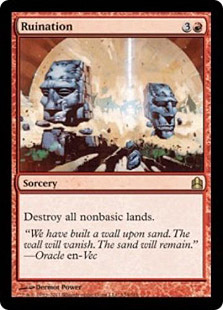 That means they can't be countered, and playing a land doesn't use the stack. 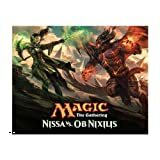 Most lands are permanents that have mana abilities (abilities that make mana). You'll usually use lands to pay for spells and abilities. You can play only one land each turn and only during one of your main phases when the stack is empty. 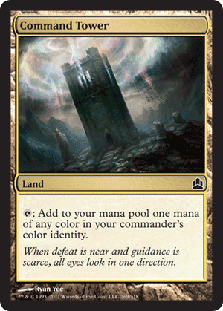 Each basic land has a mana ability that makes one mana of a particular color. Here are the basic lands: Each has a symbol in its text box that tells you what type of mana you get when you tap it. Any other land is a nonbasic land. Sorceries are spells that you can play only during your main phases when the stack is empty. Sorcery spells don't stay in play. They go into their owners' graveyards when they resolve.